To Grace (Part 5): Gaining strength in little fears. Here are the previous posts in this series. Take a look! To Grace. To Grace (Part 2): Walking Through The Fire. To Grace (Part 3): Accepting Love. To Grace (Part 4): Finding Your Voice. Saying that I’ve been feeling scared recently is an understatement. Over the past month, my muscles have gotten tighter than usual, which is causing me to fall more. Even though I know the increase in muscle tightness is connected to the colder weather, it is still scary, and it often causes me to worry about years in the future where my walking could become limited due to tight muscles and severe back pain. I don’t know how much you worry about the future. Even though you are only 12, I know what you’ve been through so far in your life. I know your pain. Therefore, I wouldn’t be surprised if you did find yourself worrying about the years ahead. However, since I know how much I worry, I do hope that you don’t find yourself worrying as much as me. It’s not emotionally healthy. I think it causes me more anguish than happiness. Though it is something that I’m trying to work on, it’s not as easy thing to fix since I’ve had trouble with anxiety ever since I was a little girl. In terms of the hippotherapy that I participated in, I focused primarily on balance, trunk strength and control, and building overall postural strength and endurance. The specific exercise that I remember really well was called “around the world,” in which I’d start by sitting normally on the horse and then swinging my legs over the horse multiple times until I’d done a complete 360 while sitting on the horse. Now that I think about it, even though this activity sounds fun to me now, I was incredibly scared when I actually had to do it. The thought of falling was terrifying to me, and without the encouragement of my horseback riding teacher, Miss Mary, I know that I wouldn’t have been able to complete my exercises. Despite the fear of falling, it was an understandable worry since I did end up falling off multiple times. Even though I know those falls and having Miss Mary tell me I needed to get up and go get my horse was hard at the time, I know that it all made me a much stronger person. Miss Mary was a very important figure in my life because she was one of the first people (not counting my parents and my physical therapists) who helped me develop a tougher skin. Therefore, despite being afraid of falling and afraid that my horse would start to canter with the other horses (which was much faster than I ever wanted to go), I know that it made me stronger. I know that your hippotherapy experience was probably much different from mine. However, I don’t doubt that you gained some of the same strength that I did when you worried about falling but then knew that your teacher wouldn’t let you fall. Either way, those little fears: the fear of falling, the fear of the horse going faster than you want him to, the fear of what lies ahead in our future in terms of our abilities, they are what make us who we are, Grace. We wouldn’t be who we are if we hadn’t learned in the beginning to let those fears propel us forward instead of hold us down. I don’t know how much that applies to you these days, but I have a feeling that you work hard too. We have to. It’s the only way through the situation we’ve been faced with. Without the strength that I’ve gained from the little fears in my life, I wouldn’t be where I am today. I wouldn’t be a junior in college who’s lived away from home since she was 16 and spends her days blogging and writing her daily story. I wouldn’t be able to talk so openly about what I have experienced. I know how easy it is to let the fears bring you down, Grace. I’ve been there. I know how hard it is to push through and tell yourself that being more independent will be just what you need. But it’s the only choice we have. Keep on keeping on, and remember that I love you. Photo Friday: The Wizard Of Oz. I will always have a strong connection with The Wizard of Oz. In 2007, I played Glinda in a community theatre production of The Wizard of Oz. It was one of my most memorable experiences during my community theatre years with the Calhoun Players because it was the first time that I got to play a main character. 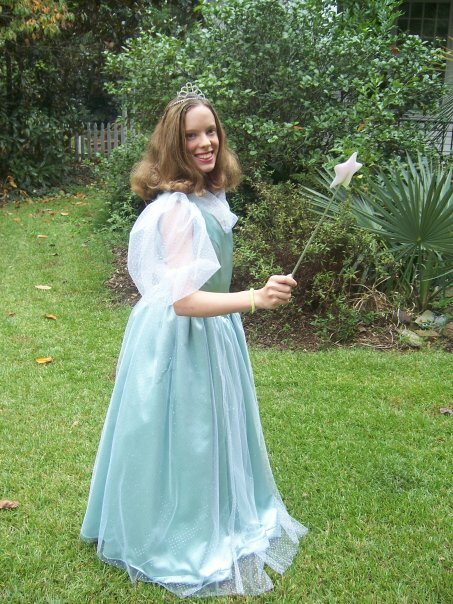 I got a blueish-green Glinda dress made and had a tiara and a wand. It was nothing short of magical. 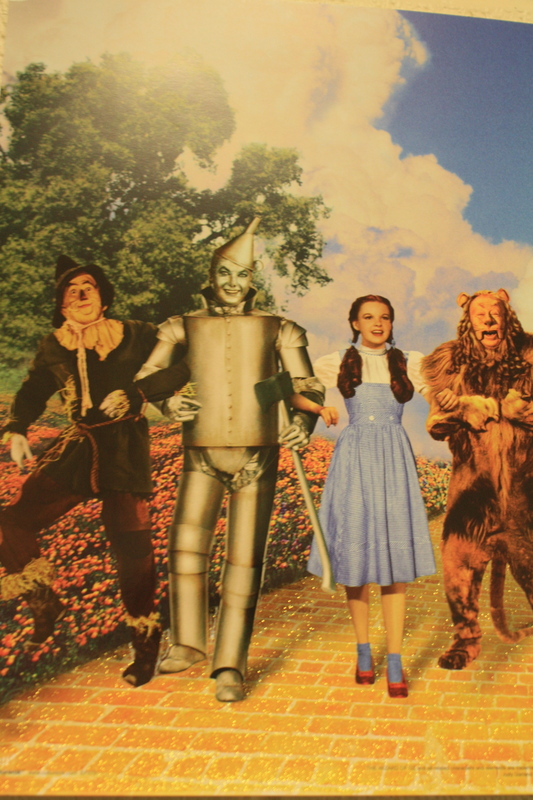 The performances of the Wizard of Oz occurred during a time of high emotion and heartache, since the sister of the guy who played the Scarecrow passed away due to an unknown heart condition the night before opening night. Though the elevated emotion added to our already present nerves, I look back on those performance nights and am proud that I got to be a part of such a strong group of people. The Calhoun Players weren’t just a theatre group to me. They were my family. During those performance nights, we came together. We came together with sad hearts, while also knowing that we all needed each other if we were going to make our performance nights as amazing as they could be. Though I have an incredibly supportive family, the members of my Calhoun Players family were also all there through a lot of my rough patches during surgeries and lots of physical therapy. They taught me that it’s possible to rise above obstacles and find a way to shine. In 2008, I did my last production with the Calhoun Players. Though I miss the “family” that I was able to be a part of, I know that all the wonderful memories will always stay with me. Through the Calhoun Players, I learned that I could be completely myself and be loved even though I was different. I learned that through tough times, everyone needs support. People like to think that they can make it alone, but we all need people by our side to be happy when we’re happy and to lend a shoulder when the harsh realities of the world just become too much for us to handle. I learned that courage is found through pain. And just because you don’t have wings doesn’t mean that you still can’t try and learn to fly. The Power of Music and Theatre. I’ve always been amazed at the power of music. It has the power to transport you back to a time, an exact moment, an emotion. Throughout life, we associate music with memories, and when we hear particular songs, we’re able to relive those memories with the same amount of emotion as when we first experienced them. For instance, right now I’m listening to Mamma Mia by Abba, which reminds me of one theatre rehearsal at Wofford last year. The director, Tori, said we needed a random dance party to get us energized and focused. So she played Mamma Mia. In a matter of seconds, everyone in the cast and crew was dancing around, acting silly, twirling each other around, and laughing so hard that they had to stop and catch their breath. It was also a reminder that everyone in the cast and crew depended on everyone else, so it was a great way to unify us again and make us remember why we love theatre. It’s been hard not being involved in theatre this semester. Though I’ve still made some great friends, I feel like I’m still missing something. Theatre was one of my sanctuaries as a kid, a place I could go and not worry about being judged. It was a place where things I was good at could shine, but the things that didn’t didn’t matter. It was also a place where I was accepted and loved by being true to myself, and I needed that so much as a kid. I didn’t just find a theatre community, I found a family. Last year when I got involved in theatre again, it made me remember just how much I love it. So next semester I’m going to try and get involved again. Though it’s a huge time committment, I may try and get involved in an area that’s not quite as time consuming so that I can still be involved without feeling overwhelmed. Has there been something in your life that you’ve always found comfort in?